Pikeville Medical Center (PMC) Heart and Vascular Institute recognizes February as American Heart Month. During this month of heart health awareness, PMC is setting the stage for the community to better understand heart health and to get a closer look at their numbers. 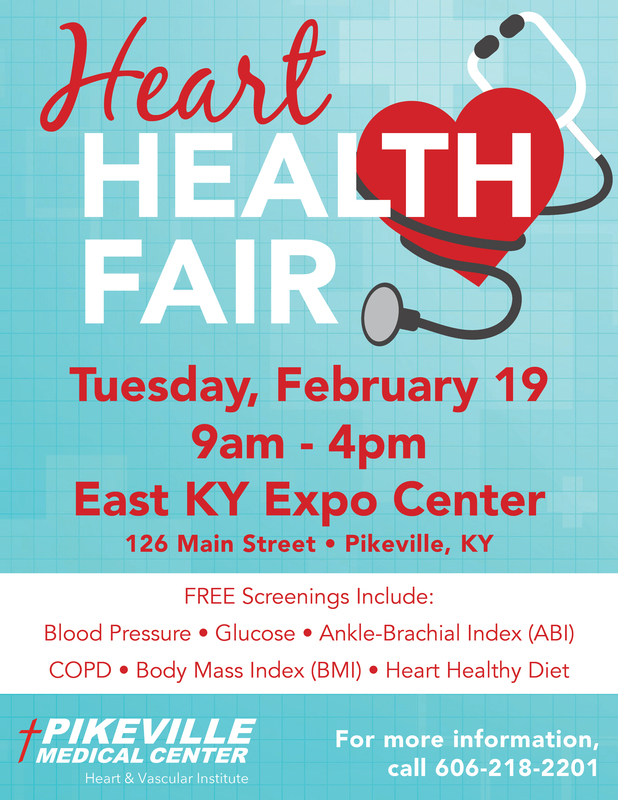 On Tuesday, February 19, the PMC Heart and Vascular Institute is hosting a free heart health fair at the East Kentucky Exposition Center at 126 Main Street in Pikeville. The event begins at 9am and ends at 4pm. The free screenings include checks for blood pressure, glucose, ankle-brachial Index (ABI), COPD, body mass index (BMI) and there will be information about eating a heart healthy diet available as well. Heart disease continues to be the number one cause of death for both men and women. Education can be vital to understanding and preventing heart disease. Representatives from the PMC Emergency Department, Trauma Center and Stroke Center will join with the cardiac team to educate the public on the importance of knowing their numbers and understanding the seriousness of heart disease. Porter says it is important to know symptoms of heart attack. Symptoms include discomfort in the chest and in other areas of the upper body and can include pain or discomfort in one or both arms, the back, neck, jaw or stomach. Other symptoms include shortness of breath, breaking out in a cold sweat, nausea or lightheadedness. Symptoms vary between men and women. As with men, women’s most common heart attack symptom is chest pain or discomfort. Women are somewhat more likely than men to experience some of the other common symptoms particularly shortness of breath, nausea, vomiting and back or jaw pain. She says everyone needs to know the signs for heart attack and even if they are unsure if they are truly having a heart attack, they need to seek medical attention. Porter and Burgess extend an invitation to the upcoming heart health screening. They say professionals will be on-hand to answer any and all questions about heart disease. For additional information about heart disease or to schedule an appointment with one of the PMC Cardiologists, visit www.pikevillehospital.org or call 606-218-2201.